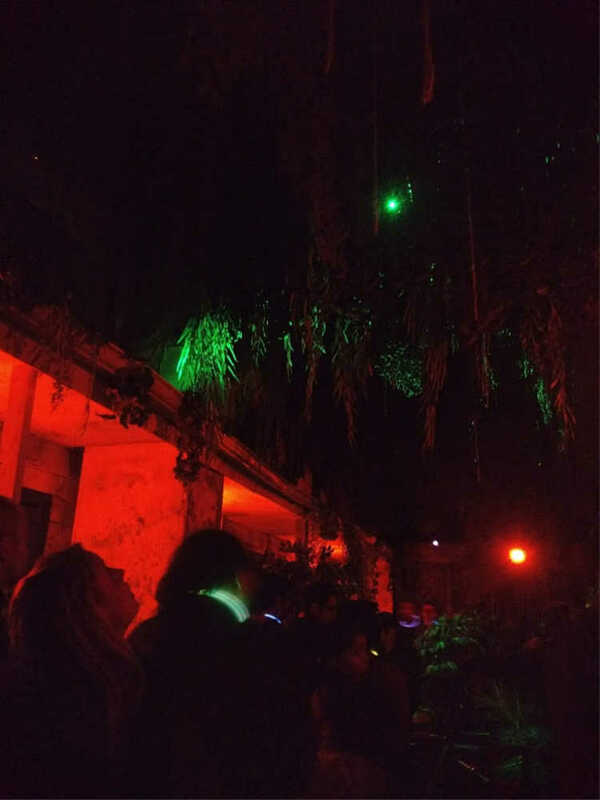 Team Old Crow Hollow reviewed this Haunted Attraction on October 14, 2018. 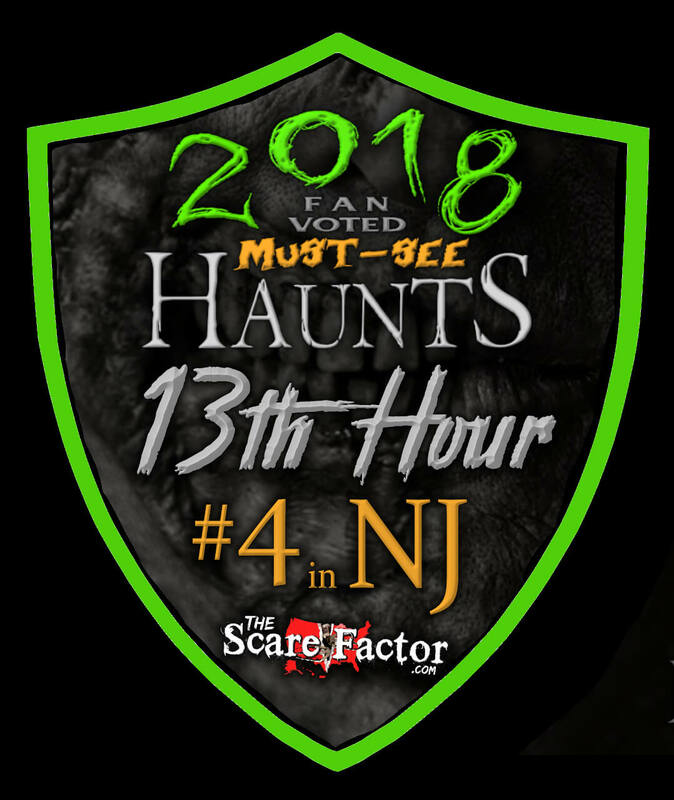 If 13th Hour Haunted House and Escape Rooms is not already considered to be one of the most elite haunted attractions in the country, it should be. 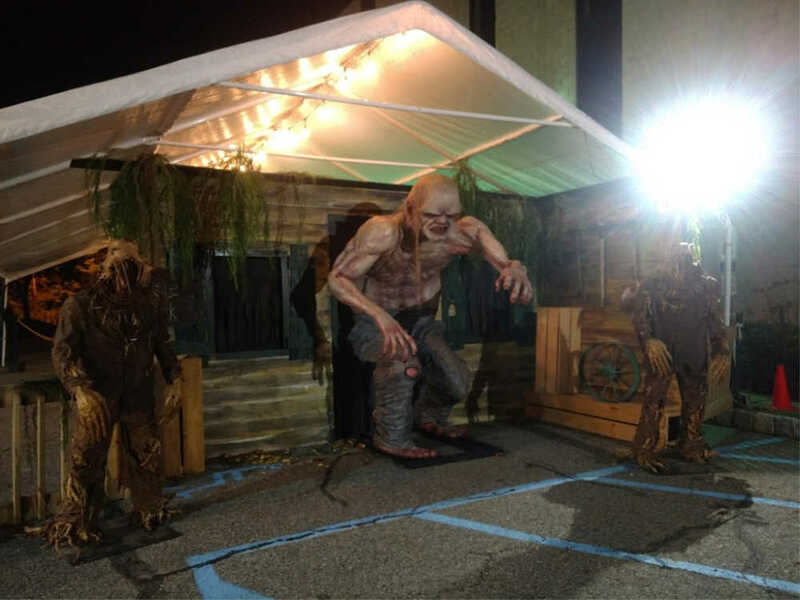 This two-story haunted house is in its 7th year and was formerly known as the Haunted ScareHouse.13th Hour offers three different sides to the horrors of the infamous Hayden family. Your journey will begin in the Hayden House of Nightmares. Their family home has been damaged in a massive storm that only serves to reveal the hidden evil that’s hiding within. Next, you will ascend into The Attic of the Hayden House where additional terrors await you. Lastly, a separate ticket will immerse you into The Darkside of the Hayden House, where their newest experience for 2018 will plunge you into total darkness. All ticket holders have the option of choosing to wear a glow stick (provided by the attraction) that will allow the actors to touch you! The cast is energetic and really into their roles. Most of this demented family lives in the downstairs portions, rather than in the Attic, but there were certainly plenty of them and, for the most part, they seemed to be everywhere! They utilize loud jump scares often but they also savor interacting and harassing you with their dialogue. 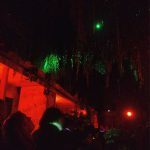 The denizens want to follow you and get into your ear and your head. As we were entering the main haunt, the area is like an actual time machine. Other than giving us the rules of the house, an impressive actor gave us a brief story of the evil Hayden Family before sending everyone back to the 1970’s when the Hayden’s still occupied this very place. We can tell you, you’re in the 70’s alright! The German-sounding scientist with a dirty, smelly jumpsuit was laughing and orchestrating the chaos was among the most believable characters we encountered. Additionally, the first floor is full of weird folks popping out of every nook and cranny and there’s more things that will come at you to try and grab you than you can shake a stick at! This is a contact haunt, but not overwhelmingly so. You can also choose to not be touched by opting out of the glow necklace before entering. So, you might be safe from the actors physically, but this place has more tricks up its sleeves and, we assure you, you aren’t safe. We opted for the glow sticks and, while while we were in the Attic, one of the clowns stole a ride on the back of one of my teammates! The costumes within the attractions did fit into the scenes and worked well for the characters they were portraying. They mostly consisted of sinister country folk, clowns, etc. Because of this, the costumes didn’t need to be extremely elaborate or detailed. What they utilized worked. They also looked real without looking like plain, everyday clothing. The makeup was exceptional as every character seemed to be made up to the max so that the actors’ faces popped out. Every character seemed to have detailed, full-face makeup that was hard for us not to stare at at times. The masks used were also realistic, as if they could be the person’s real head. There wasn’t a lot of them; they seemed to be more focused on using makeup. The scientist at the front was a good example of an appropriate costume. The combination of his attire, makeup, and (unfortunately for us) his smelliness took his character to a whole new level! 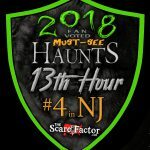 13th Hour is very easy to find; although, it’s located inside a fairly standard-looking commercial building, which is one of the very few down sides of the haunt. As previously mentioned, you can choose whether you want to get touched or not and despite that, it felt safe going through the house. We didn’t notice any real safety issues and the actors seemed to be good at knowing the level of how far they could push it. The staff that we encountered were professional, friendly, and personable throughout. All of the information you may need is easily accessible on their website including one of the most detailed back stories we have seen so far. From the outside, if it wasn’t for the music, props, and decor, you may not guess what’s waiting for you inside this standard-looking commercial property. It’s hard to know what to expect, but once we were inside, the atmosphere was great. On the inside, the atmosphere is completely different. The theming is so well done that it is just weaved into every aspect of the experience, from the characters you will come across to the areas between the scenes! Right off the bat, the time machine sets you up and gives you an idea that this is going to be a high-tech haunt. 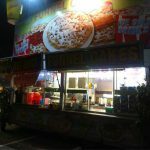 This journey back in time is full of many different special effects, from moving floors and high-end animatronics to many different lights, sounds, screens over our heads, effective strobes, lots of unexpected and entertaining things, a spinning floor. and noise-makers. It’s a special effects extravaganza, but they were effectively used. We got a lot of “wow” moments and scares from them. We must say this category was very well done. We traversed through what looked to be the Hayden’s tool shed full of chainsaws and other implements to an outdoor area queue line bringing us to a front porch. Yes, there are some movie-quality sets to admire in their waiting areas! Some of the sets were designed to where members of the family could pop out from all over the place. We were actually glad to be waiting for a little bit as it gave us a great chance to look around and experience the full show. Before you go inside, it’s hard to tell what the theme is going to be unless you read the full background story on the website, and we highly recommend doing so. The theming is as consistent as country gravy once you get inside and your tour begins. Everything is connected, from the horrible Hayden Family all the way down to their escape rooms! Each one represents rooms in the Hayden House before the damaging storm. In The Attic, there was a carnival theme in a big part of this area. It was full of clowns and more of their realistic animatronics. The Dark Side of the Hayden House takes you to a totally dark world where many live things await you. They have so many fright techniques at 13th Hour that I haven’t seen used before. In other words, they will definitely get you here one way or another. They utilized so many different places and techniques for this sicko Hayden Family to get you. If the family members aren’t attacking you themselves, the special effects will catch you by surprise. It’s more of a barrage of scares… especially in the downstairs area. They do separate you into small groups so they can target every member of your group. It makes the show very unpredictable. Some of the scare tactics included a guy pushing the front end of a car at us, surprising sounds, and vehicles that even tried to repeatedly run us over! They will do whatever it takes to get a scare in. The pitch black areas of The Dark Side could certainly be terrifying for a lot of people. Mix that in with all of the things that are hiding from within and quite a few screams will be produced. Our group was small and we went through by ourselves. While there are many parts that are intense here, it is also a fun experience trying to find your way in the dark. Be sure to keep your hands in front of you at all times and keep moving. Whatever is waiting for you in there will spring out at you unseen, but with quick bursts of light that are strategically placed to keep you on track and find your way. It’s creative, which says a lot about a maze that’s mainly about darkness. 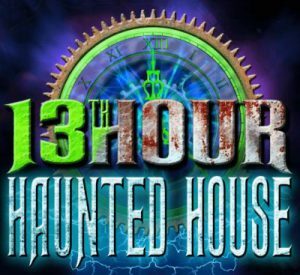 There is a solid hour of entertainment to be experienced at 13th Hour if you choose to add the dark attraction to your visit list. 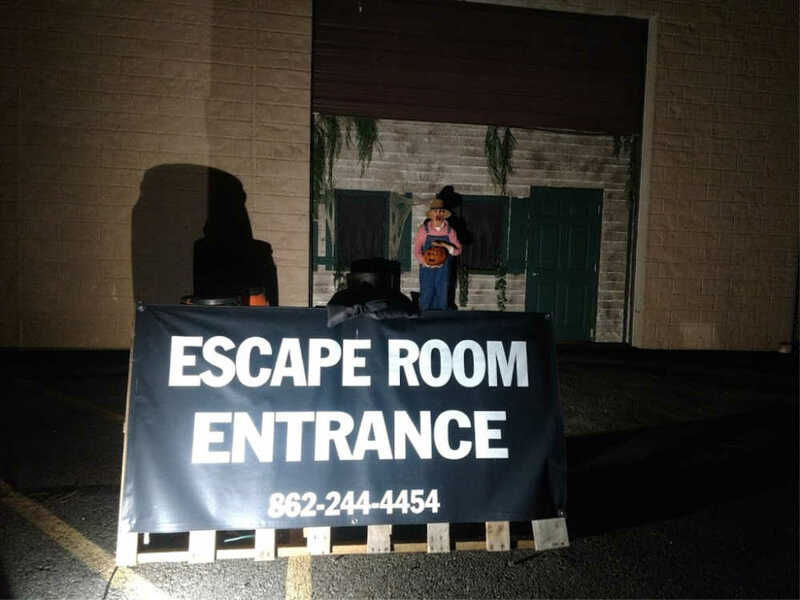 If you opt for adding an escape room as well, then you will have a two-hour experience. The outside entertainment, while you are waiting in line or hanging out after your trip through the house, is plentiful and expands the whole experience. 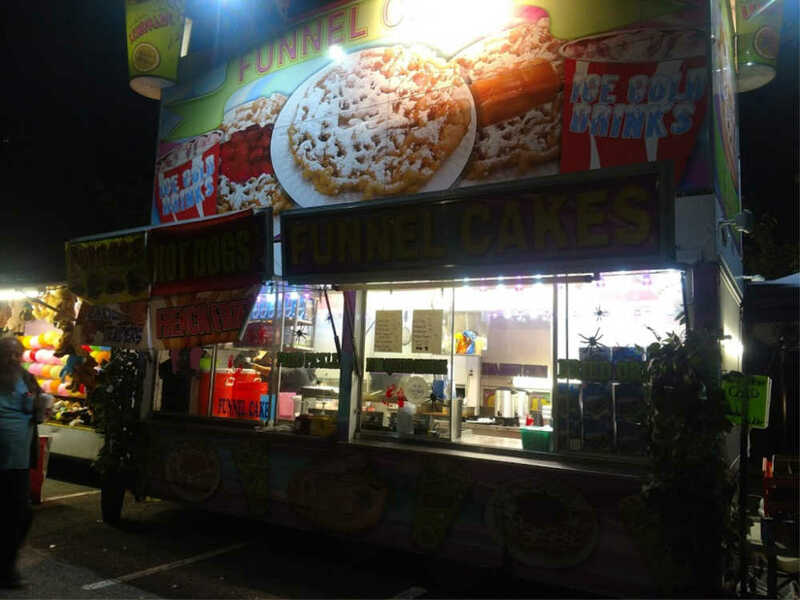 Outside the building, there are carnival games, food, and hard rock music playing like Rob Zombie and Ghost. They also have some huge props you can take pictures with, giving you something else to do while you wait. 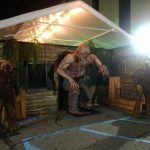 Ticket prices for the “2 Floors of Fear” start at $28. This includes admission to both the House of Nightmares and The Attic. For those who want to go all out and find your way through the dark, you can purchase combo tickets for $35. They also have other ticketing options that include an escape room of your choice and you can purchase them with or without Dark Side. The pricing is extremely reasonable here and, if the line to get into the main 2-story haunt is too long, you can get a fast pass for only $10 per person. The line moves in big chunks though, as 20 or more people at a time are loaded into the the pre-show area. 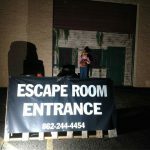 Overall, this one of the most fun and entertaining haunts that we’ve visited this season and, as good as the haunt is, we recommend trying at least one of their 5 escape rooms, which are at the level of some of the best in the country.